Biophilic design brings outdoor elements indoors to create a soothing effect. 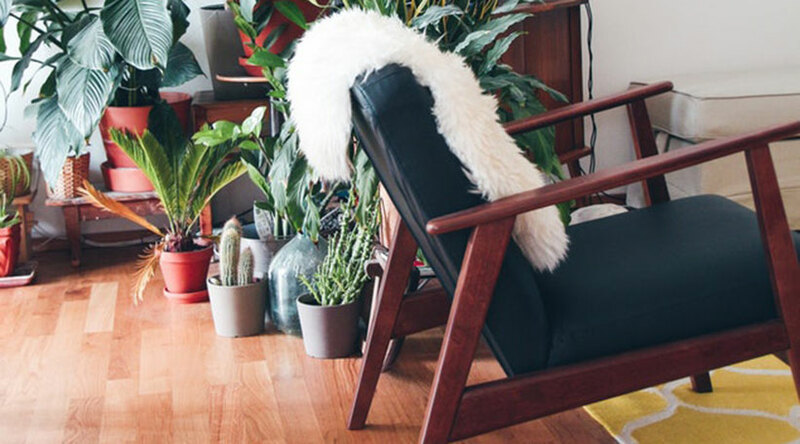 More and more of today’s homeowners are discovering the advantages of biophilic design, which is a way to draw a deeper connection to nature by bringing outdoor elements into our interiors. Already emerging as a trend in commercial spaces, biophilic design is now making its way into residential spaces as well. Considering that most Americans spend the vast majority of their time indoors, biophilic design is a way to ensure that we gain more exposure to natural elements, such as plants and sunlight. Not only is this likely to improve our mood and our general sense of wellbeing, it could possibly even improve our health. As an example of a potential health improvement, some progressive companies are using emerging living green wall technology, which acts as a biofilter to improve indoor air quality. Homeowners can incorporate biophilic design with a few simple decorating choices. Certainly, incorporating plants in various rooms of the house is one way to bring the outdoors in. Instead of traditional potted plants, you might want to give your indoor plants a “landscaped effect” by grouping them together, perhaps even setting them off in recessed areas filled with decorative stones. Also consider indoor water features, such as a floor-standing or wall-hanging fountain. Using window treatments that let in natural light is another technique that is consistent with biophilic design. Among the products that would work well are top-down/bottom-up shades that let light come in at the of the window while still providing privacy. When weather permits, open the windows to let the fresh air permeate your home. Natural finishes are another great way to show a biophilic sensibility. For instance, you might consider wood floors or exposed wood ceiling beams stained in light tones that allow the natural grain to show through. Another biophilic-consistent idea: Make better use of patios and screened-in porches by placing furniture groupings in those areas. Exterior sofas, loveseats, easy chairs and/or dining ensembles in weather-resistant fabrics will make your indoor-to-outdoor living space appear more seamless. The paint you select can be an important element in biophilic design. From a health point of view, you can choose a product that is low in VOCs to ensure better indoor air quality. From an aesthetic perspective, colors that are reminiscent of nature are consistent with the trend. Think tranquil blues, calming greens, sunny yellows and earthy neutrals as a way to provide an outdoor feel to your indoor spaces. Using a combination of color, design, natural elements and eco-friendly products is the best way to create a biophilic home. If you’re interested in making the transition, stop by your local paint and decorating store for advice.